Louisa Lumsden CBE (1840-1935), the first prominent female figure at the University of St Andrews. Louisa was one of the original students of Girton College Cambridge. She taught classics there and later at Cheltenham. In 1877 she became Head of St Leonard’s school in St Andrews. In 1895 she was warden of a new university hall of residence, but resigned in 1900. 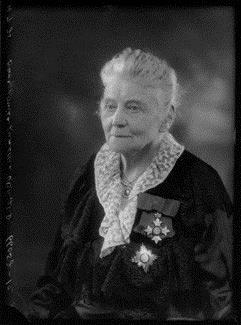 Although her initial energies were put into women’s education, she was a strong proponent of women’s suffrage In 1908 she was president of the Aberdeen Suffrage Association. She had a horse-drawn caravan, which was used for campaign tours. although never a militant herself, she admitted to fellow-feeling. One has a mean feeling when one is quietly enjoying the good things of life and others are in prison for their convictions. This entry was posted in feminist, history, The Historical Birthday-Tea Party, Uncategorized and tagged Feminist History, Louisa Lumsden by Cherry Potts. Bookmark the permalink.